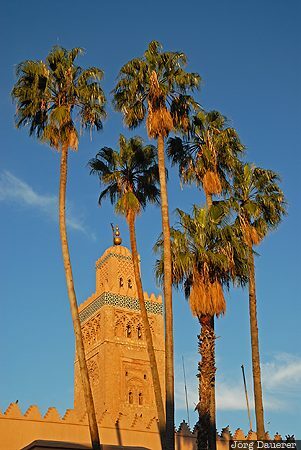 The minaret of the landmark Koutoubia Mosque behind some palm trees illuminated by warm morning light. The Koutoubia Mosque is the largest mosque in Marrakech. The minaret was used as the model for the Giralda of Seville and for the Hassan Tower of Rabat. Marrakech is in Marrakech-Tensift-Al Haouz in central Morocco. This photo was taken in the morning of a sunny day in February of 2010. This photo was taken with a digital camera.